On An Overgrown Path: Is it me or is it the music ? Is it me or is it the music ? I am taking the summer off music ... Salzburg has the worst offering since I can remember, Bayreuth is its usual self, I have no trips planned to London and do not held the BBC Proms in the same respect as you because of the very poor acoustics. I am basically relaxing and much to my surprise am not missing music. Is it me or is it the music ? Emails a regular reader, occasional Overgrown Path contibutor and veteran festival goer Antoine Leboyer. Antoine also writes for the French classical music site ConcertoNet where his review for a Gustavo Dudamel Prom was memorably headlined Faut-il fermer le Royal Albert Hall - Should they close the Royal Albert Hall? Last night a sold-out Snape Maltings rocked to Music from the Penguin Café, Arthur Jeffes' tribute to the famous Penguin Café Orchestra. This influential band was founded by his father Simon Jeffes in the 1970s and featured here earlier this year in Randomness is a very special thing. As we drove home last night after seeing young, and not so young concert goers dancing in the aisles of the Maltings to Simon Jeffes hypnotic rhythms, I reflected on my own very special summer of lean forward festivals and unfamiliar and random music. 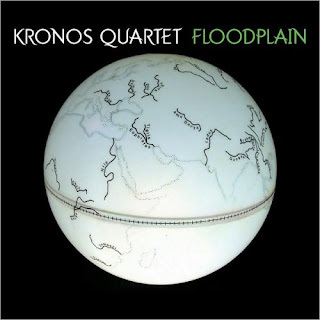 What is interesting is that festivals like the Snape Proms and Les Orientales in France, and new CDs such as the Kronos Quartets Floodplain, seen below, have not only introduced me to new sounds, they have also made me hear familiar music in a new way. After listening to, for instance, Serbian composer Aleksandra Vrebalov's ...hold me, neighbour, in this storm... from Floodplain, with its taped church bells from an Orthodox monastery and Muslim call to prayer, a familiar work such as a Beethoven symphony appears in a completely new light. Hearing the Beethoven again is like viewing a familiar painting after years of grime have been removed by an expert restorer. While in Snape for the Tashi Lhunpo Monks residency last week I bought a copy of Faces of Findhorn in a charity bookshop in nearby Woodbridge. The Findhorn Community in Scotland has been exploring alternative approaches to the familiar since the 1960s and music making is part of life in the community, as seen in the header photo. Findhorn is a controversial experiment and some view it as a little more than a new age joke, including the supposedly liberal Independent which ran this headline in 2001 - 'Findhorn, the hippie home of huge cabbages, faces cash crisis'. If Findhorn and giant cabbages interest you it is worth visiting Auroville and Arcosanti. 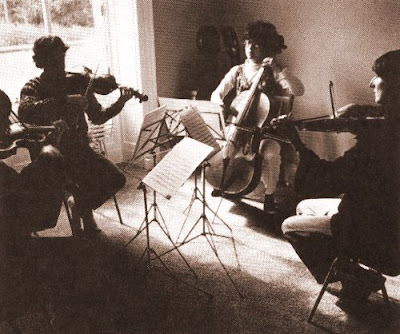 Which neatly brings us to one of the Kronos's collaborations with Terry Riley. In the context of alternative communities with musical connections I should have mentioned the Halycon Theosophical Community in California. Incidentally it takes a Frenchman (albeit living in Switzerland) to know that in English acoustics, when used to describe the characteristics of an auditorium, is a plural noun. The common, and wrong, usage by BBC announcers and others these days is the acoustic of the hall. Great post. Particularly like how it gets at how we can refresh our hearing/listening by trying new things then going back to old familiars. It's so easy to fall into ruts, both in music making and in music listening, and when we do we're missing a lot that's out there. All the new brain research shows how it can rewire itself in various ways depending on how we use it. Also appreciate the clarification on "acoustic". I'd noticed the singular form was creeping in and didn't understand why. Wonderful to hear Findhorn still there.